The surprise measure takes the total sum injected into the economy via government-backed “quantitative easing” to £175 billion ($294 billion). The sum exceeds the £150 billion ($252 billion) the bank was authorized to create when the plan was announced in March. But in an exchange of letters with UK finance minister Alistair Darling, Bank of England Governor Mervyn King said an extension of the scheme was necessary to meet the government’s 2 percent inflation target. Quantitative easing is often described as “printing money” — although no new notes and coins are actually created. Instead the bank “creates” more money on its balance sheet, then uses this to buy banks’ assets such as home loans and government bonds, thereby pumping extra cash into the system. The banks all have accounts with the Bank of England, and the money will simply be credited to those accounts. The creation of more funds will be done electronically. The bank expects the additional funds to be released into the economy over the next three months. The bank’s Monetary Policy Committee also left interest rates unchanged at 0.5 percent — the lowest rate in the bank’s 300-year history — for the fifth month in a row. 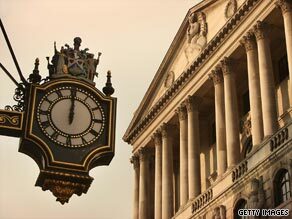 The bank said British GDP had slipped further in the second quarter of 2009. But while the world remained in recession and financial conditions remained “fragile,” the bank said there were signs that the British economy may be emerging from the downturn. “The pace of contraction has moderated and business surveys suggest that the trough in output is close at hand,” the bank said.